Club Penguin Cheats by Mimo777 Club Penguin Cheats by Mimo777: Anchors Aweigh: New Club Penguin Song! 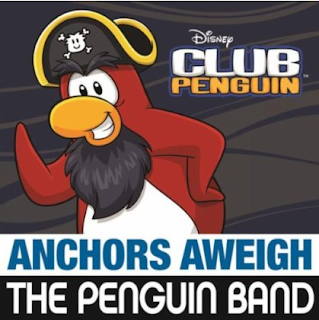 Anchors Aweigh: New Club Penguin Song! On Amazon, Club Penguin has released a sample of there new song called Anchors Aweigh! This song will be fully released August 28! Are you going to buy this song!? Listen to the sample and tell me what you think! Worse then The Cadence Song, i hope they bring the Song "Better Days" sung by The Penguin Band to iTunes, that would be great! I thought Rockhopper was supposed to sing it, not some silly boy band. New Club Penguin Blog Sneak Peek! Coffee Shop Grand Opening - Thank You! Club Penguin Message: Jet Pack Guy! The Club Penguin Field Op Number 97 Cheats! Club Penguin Coffee Shop Update! Club Penguin Times #358 is Here! Club Penguin August 29: Pineapple Costume! Club Penguin New Coffee Shop! Club Penguin Sneak Peek: Smoothie Smash! Club Penguin August 25: Apple Costume! Anchors Aweigh - Sneak Preview! Club Penguin Pin Cheat - FRUIT COMBO PIN! The Club Penguin Field Op Number 96! How to Enter the Temple Of Fruit! Club Penguin Party FREE Items! Reviewed By You: Staying Healthy! Sneak Peek: August Adventure Party! Club Penguin Has Sent Us A New Spy Phone Message! The Club Penguin Field Op Number 95! Club Penguin New Home Page & Start Up Screens! Club Penguin Times #356 is Here! New Club Penguin Book: The Epic Official Guide! Club Penguin Brazil Card Games! Jet Pack Guy Senses "Weird Energy!" Club Penguin Pin Cheat - BANANA PEEL PIN! The Club Penguin Field Op Number 94 Cheats! Club Penguin Igloo Decorating Contest! Club Penguin Home & Log Off Screen Updates! Club Penguin Times #355 is here! "Captain Rockhopper vs. Mighty Squid!!" Video! Like My Igloo: August 5! Club Penguin Field Op Number 93 Cheats! Club Penguin Pay Day: August 1! Club Penguin: Penguin Style Sneak Peek! Like My Club Penguin Igloo: August 1!